This year I’ve been making grand attempts to ditch my comfort zone, and not just with my writing. I’ve read books in different genres. I’ve branched out socially in my “real life” and in the way of social media. I’ve altered the way I eat and the way I exercise. I’m even (slowly) reorganizing my closets and kitchen cabinets. Anything to make life different or healthier or easier or… fuller, if that makes sense. Call me crazy, but I think the magic really is happening. I can genuinely say that I feel better: more relaxed, more accomplished, and, simply, happier. I also feel motivated to continue stepping out of my comfort zone. I mean really… what’s the worst that can happen? 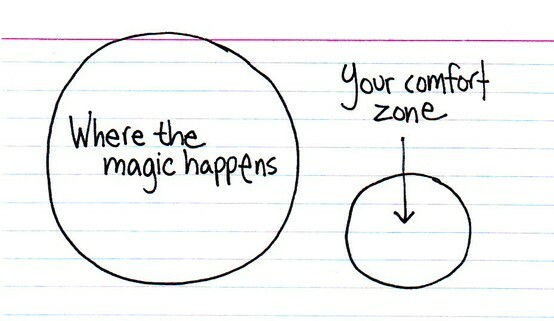 I’m curious: How have you left your comfort zone lately? Ah yes. Me too. Sounds like you’re making more progress than me, though. 🙂 Also trying to think “outside the box” while making revisions on the novel. Not always as easy as you think! Enjoy your day as well, Kris! I’ve left my comfort zone by dipping my toe into the world of, sigh, work, and by getting serious about passing my driving test before I’m dead. I’ve also been slightly more adventurous with my social life this year, but I think now I’ve just entered a new comfort zone. Probably time to take it up a notch. Funny how stepping out eventually becomes the “new” comfort zone. Good luck with the driving test! That’ll be a huge accomplishment! Not as much as I need to! Great post. Thank you for this. Thanks so much, Lynn. And I know you’re a runner, so something tells me you’re pushing your comfort-zone limits all the time! Not as much as I need to for me, too. (Except my experimental month without sugar.) I know I need to work on figuring out a better balance in my life (work, writing, diet and exercise, sleep, social, etc.) so this is a good reminder for me. Thanks! I’ve got a decent balance going now, but I know I’ll be doing a major readjustment when my husband comes home in a few months. How did your experimental month without sugar go? I’ve cut it out *almost* completely, except for little splurges here and there (like the tea party my girlie and I went to last weekend!). I have to say, I think the sugar cutback has been a major contributor in how much better I feel physically. I hadn’t thought about this, honestly. I guess that with my re-discovery of photography, I thought I would feel self-conscious walking around and taking pictures with my camera, but I DON’T. That’s stepping out of the comfort zone that you didn’t know you had, right? I’m going to try this out. And yeah, like Rebecca said, I need a better balance in my life, too. What with school and friends and writing and that darn French test, I’m totally stressed. Thanks for this! Oh, definitely a big step out of your comfort zone! I think I might feel a little self-conscious walking around with a camera too… so cool that you DON’T and that you’re loving it! I’m job hunting ^^; New jobs, no matter how much they suit your skill set, are always stepping out of your comfort zone. But I think I need to be a little more like you and broaden all my horizons! I would think job hunting would be a HUGE step out of your comfort zone. I read somewhere that moving, divorce, marrying, having a child, and switching jobs are the most stressful events in our lives, so yes… best of luck! I dropped the f-bomb in my latest story *blushes* whereas up until now I couldn’t say more than h-e-double-toothpicks. I really try not to use language unless it’s called for and well, it is. VERY much outside my comfort zone, although sadly, it’s becoming more comfortable. As are you! I was just looking at your out-of-comfort-zone book list and contemplating tackling Dickens. If Jaime can do it, I can too! I have to admit that almost everything I’m doing right now in the writing world is outside my comfort zone. I used to send my MSs to only my sister. I got a crit partner (leap beyond my comfort zone), who convinced me to query, which I did (super outside of comfort zone), and now that book is going to make it’s way into the world (so far outside of comfort zone it’s terrifying). It’s awesome, but I’ve always written mostly for myself, because I can’t NOT, if that makes sense. And while I’ve always had the desire to share stories with people, I was too scared to follow through until this past year. No turning back now, huh? 🙂 I’m excited to put a book into the world, but it is definitely FAR outside my idea of comfort! Oh, Erin… I haven’t really allowed myself to think too seriously about my stories one day making their way into the world. If I do, the terror takes hold and I want to crawl into a hole. Definitely a huge leap out of my comfort zone to make a serious go at a writing career. I’m so proud of you for being so courageous! It’s clearly paying off! I took a break from writing over the summer. Unintentionally, I kept meaning to start back up, but wasn’t ready. Now? I’m getting back into it, but it’s scary. Because this WIP is really hard for me to write. Hard for me to figure out. It’s taken me completely out of my comfort zone. My last WIP was a totally departure from my comfort zone. I love it though, and it’s the one that scored me an awesome agent, so in hindsight, I’m so happy I stretched. I also took the summer off from writing new material. I revised tons, though, and now I’m ready to start on some new stuff. Exciting but scary! Loved this, especially the graphic. I haven’t gotten out of my comfort zone lately except for my current NaNo. I should probably branch out soon. This is actually a good reminder for me. I rarely step outside of my comfort zone, and I really need to do that more often. I’m very much a creature of habit, but it’s not really a good thing. Intrinsically, I’m a creature of habit too, Jess. (I seriously eat the same breakfast every. Single. Day.) That actually made it easier, though, when I started branching out a bit. Once I tried new ways of life, it wasn’t so tough to make habits out of them, if that makes sense. Here’s to stepping out of our comfort zones together! Ooh, I adore present tense! For me, using past tense would be a step out of my comfort zone. Good luck with your NaNo project!